The insurance company’s “explanation of benefits” explains nothing. In fact it often confuses matters more. Also: People believe their insurance companies are paying more than they really are, because quite often the explanation of benefits leads to that conclusion. When I founded this company, in fact, a major impetus was the fact that no one could understand an explanation of benefits. Or a bill. Sometimes it seems that there’s a conscious effort to hide information, just as there is in the old street-con card-hustler game called “three-card monte” (see an example in this Youtube video). And in fact there is. Discussing the explanation of benefits, an insurance executive told me once, “We make them confusing intentionally, so people can’t understand them.” Anyone who has taken even a passing glance will say that confirms a suspicion: “This is not a bill” and “This page intentionally left blank” and “You may owe your provider” are all common occurrences. This paperwork is described as “a mismanaged, tangled, screwed-up and incompetent mess,” by Dave deBronkart, a.k.a. ePatient Dave, in this blog post: It takes off from a New York Times piece on the labyrinth of medical bills by Tara Siegel Bernard. We’ve seen a lot of these, especially in our recent partnership reporting on and crowdsourcing health prices with our award-winning journalist partners, investigative reporter and anchor Lee Zurik at WVUE FOX 8 Live and Jed Lipinski and Manuel Torres at NOLA.com I The Times-Picayune, and their teams. To read about this partnership and to see our work, go here; to read about other national partnerships at ClearHealthCosts, go here. Because we’ve seen a lot of them and can show you the results, without revealing patient’s personal health information but using their shared paperwork to enlighten you, we’re doing this blog post with some examples. Insurers are paying a lot less than people think they are, and the EOB is designed to perpetuate that confusion. 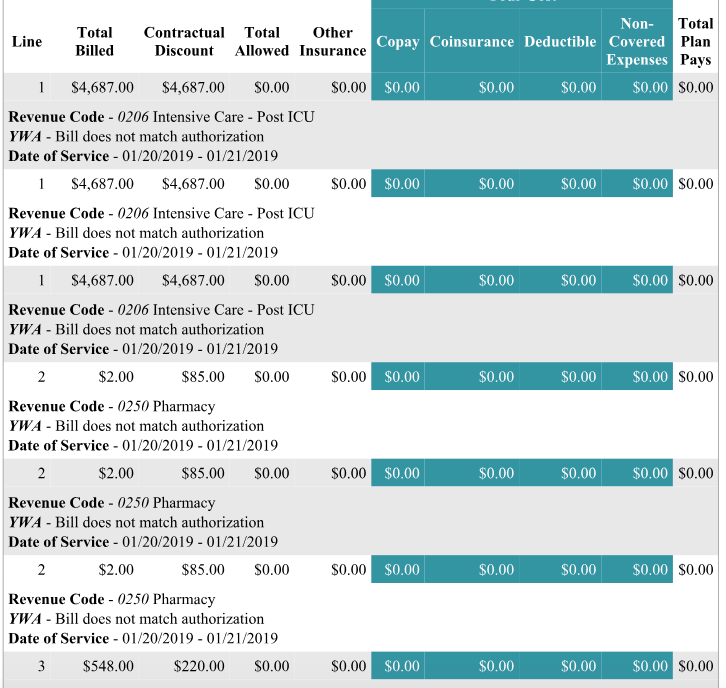 Often the insurer imposes a discount (or writedown or reduction) off the billed price, then adds the “discounted amount” and payment, and puts them on one line. This makes it look like the discount off the contracted rate is part of the payment. Time and again, people assume that the discount and the payment add up to the insurer’s contribution. That is not true. Many insurers don’t identify what procedure actually took place. They often leave out the procedure name and the procedure code, leaving the patient with only a date of service and a provider name. This seems intentionally obfuscatory. Lipinski wrote about this practice at Blue Cross and Blue Shield of Louisiana in this post. We have seen it before, and we think it’s widespread in the industry — and a way of obscuring what really happened. Often the numbers on a bill don’t add up. It seems sometimes that a string of chimpanzees are typing random numbers into a bill. This adds to the general confusion. Anyone who’s tried to explain or argue a bill with the help of an insurer or a provider knows that hours on the phone in phone-tree and voice-prompt hell, and listening to hold music, are required to even ask a question. Asking the question seldom guarantees a straight answer. So here are some examples of bills, part of our continuing effort to shed light on billing and explanation of benefits practices. The insurer applied a “discount” to the billed price, but did not pay anything. The patient paid the allowable or discounted price in full. So how much did the insurance company pay? The payments/adjustments total $359.95, but how much was payment and how much was adjustment? The patient thought the insurance company paid the entire sum. Exactly the same thing on exactly the same day? Two abdominal ultrasounds, one transvaginal and one not. And both are billed to her, with the insurer paying nothing. She has polycystic ovary syndrome, so this test must be done regularly, and she was shocked at this year’s bill. Same patient, same procedure, preceding year: Only one. That time, the plan paid $110.64, and only one was authorized. A $2,130.90 bill. Insurance “discounts” of $1,432.03. Insurer paid nothing. Patient owes $698.87. 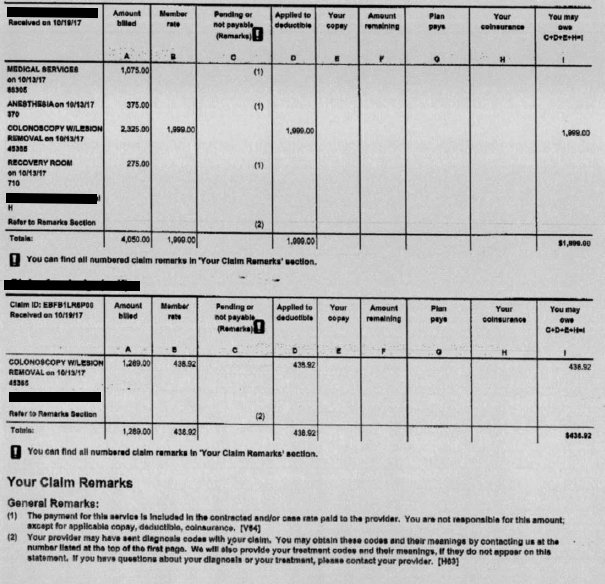 The patient thought the insurer paid $1,432.03. 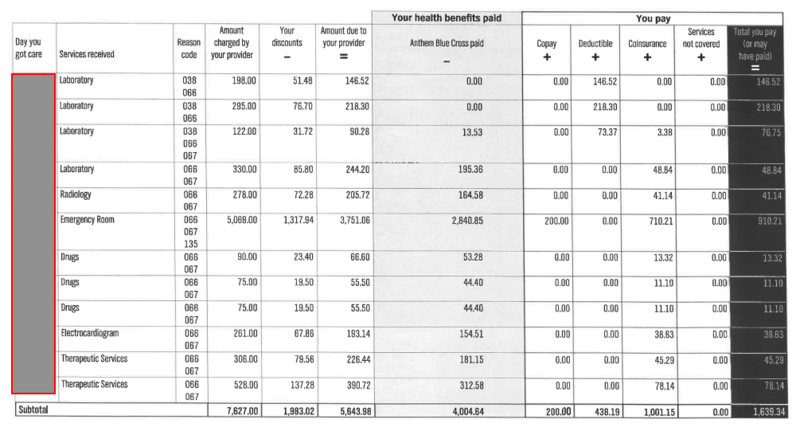 So the payments and adjustments (discounts, or whatever you want to call them) on this colonoscopy totaled $14,586.41. But what did they really pay? Also, it’s a colonoscopy, so how could the charge be labeled “Pharmacy”? By the way, the patient believed, once again, that the insurer had paid the entire $14,586.41. The numbers don’t add up: Charge, $307. Contract savings, $147. Insurance paid, $0. Patient paid, $80. But $147+80=$227, not $307. So patient pays $80, twice? And what’s the meaning of the denial code “bundled”? Confusing. 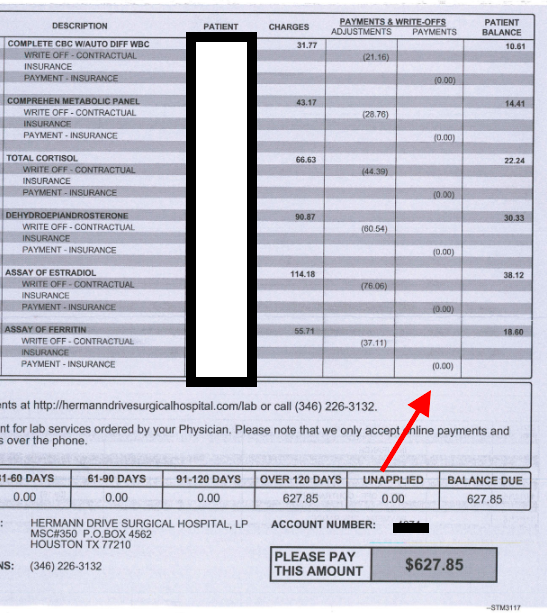 It’s a bill for a brain MRI of $6,349. The insurer approved just $380.23; they paid $201.13, while the insured person paid $175. And what is the mysterious “sequestration” of $4.10″ ? Glad you asked! Look here and here: Automatic, across-the-board spending cuts from 2011. 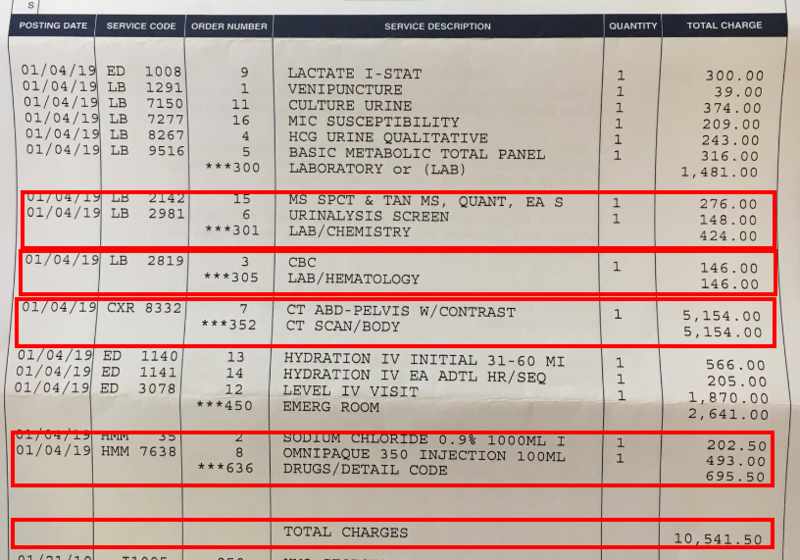 And that blood test — provider billed $98, plan approved nothing, and charged patient nothing. Mysterious. She said it was an “extracranial study” with a CPT code of 93880. On a bill of $1,171, they paid $238.73. She pays $592.30 in combination of deductible and coinsurance. Her note: “I got three stitches.” Bill: $1,124. No insurance discount, no payment, no explanation — just instructions on how to pay. Emergency room charge: $2,130.90. Insurance paid nothing, but applied a $1,432.03 discount. She paid $698.87. Gall bladder removal. 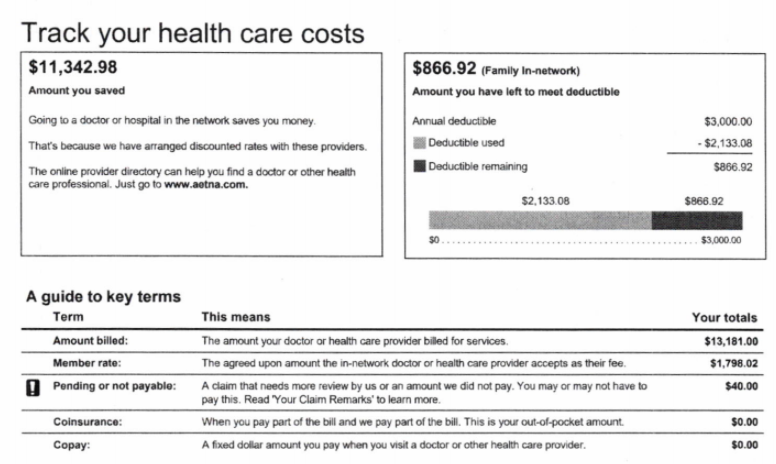 Of the $10,577.10 charge, Blue Cross discounted $6,214.85 and paid $3,489.85; patient paid $672.46. Chest X-ray for $265.78. Compare others here, from $20 to $988. MRI at Sloan-Kettering. Fairly clear. Billed $5,329.69, plan paid $1,659.01, patient paid $184.33. Allergy test office visit. 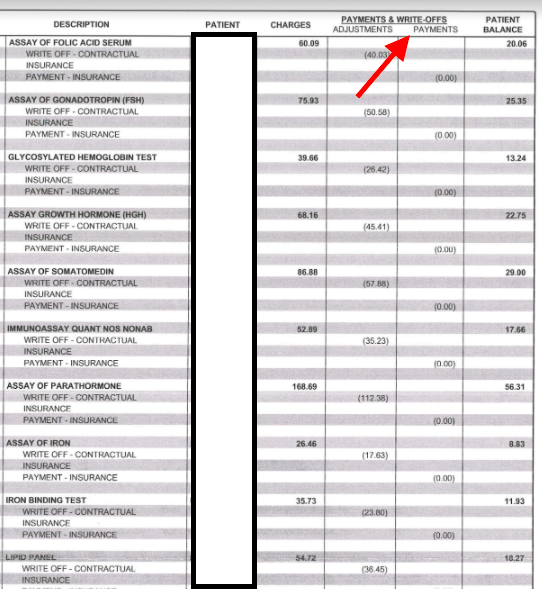 Charges $411; payment-adjustment together $341 — so what did they actually pay? No way to know. A discount off a fancifully high sticker price does not necessarily mean you saved money. This procedure, an echocardiogram with Doppler, can be found under $400 on cash at many places in the neighborhood of Clearwater, Fla., where this procedure took place. Here’s a search on our site for cash prices in that locale. What did the plan actually pay? 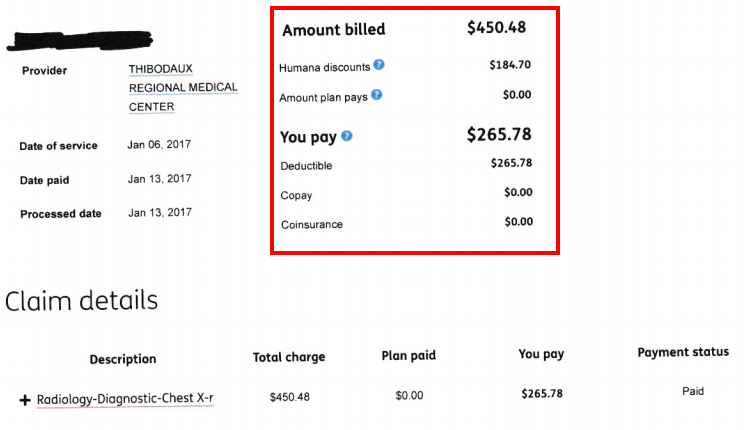 This emergency room visit shows “Plan Savings,” which is clearly different from “Plan paid.” But what did the plan pay? Nothing? And was the $449.86 applied to the patient’s deductible? A colonoscopy. The community member told us: “I received a cost estimate from Kaiser of $1,200 for the total cost of the procedure prior to the procedure. 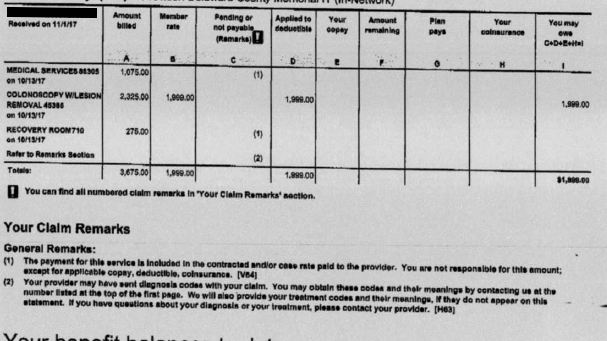 They billed the procedure at $16,047.10.” The bill from Kaiser is not illuminating: $9,414.14 is a combination of “Paid by Insurance/Adjustments/Discount” — leaving the patient responsible for $6,632.96. Again, she had no way of telling what they actually paid, but thought it wast he $9,414.14. Sometimes, though, the bills can be pretty clear. 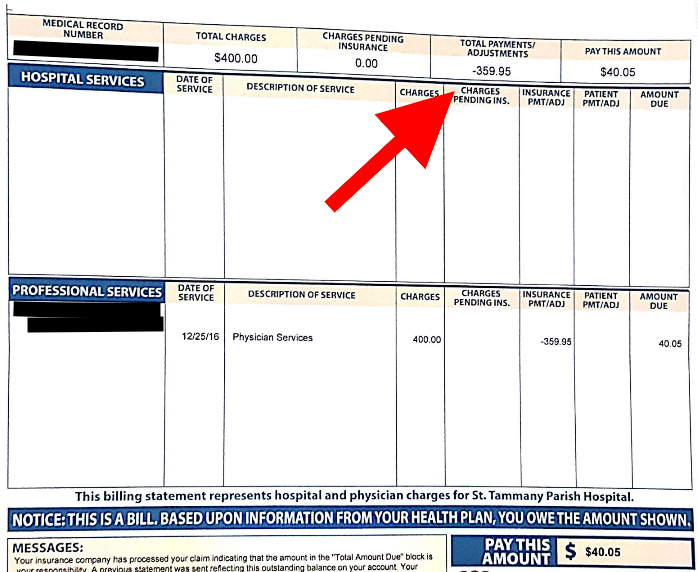 Here’s one for an emergency room visit: clearly marking the charge, the discount, the amount due to provider, what the insurer paid and what the individual is responsible for. 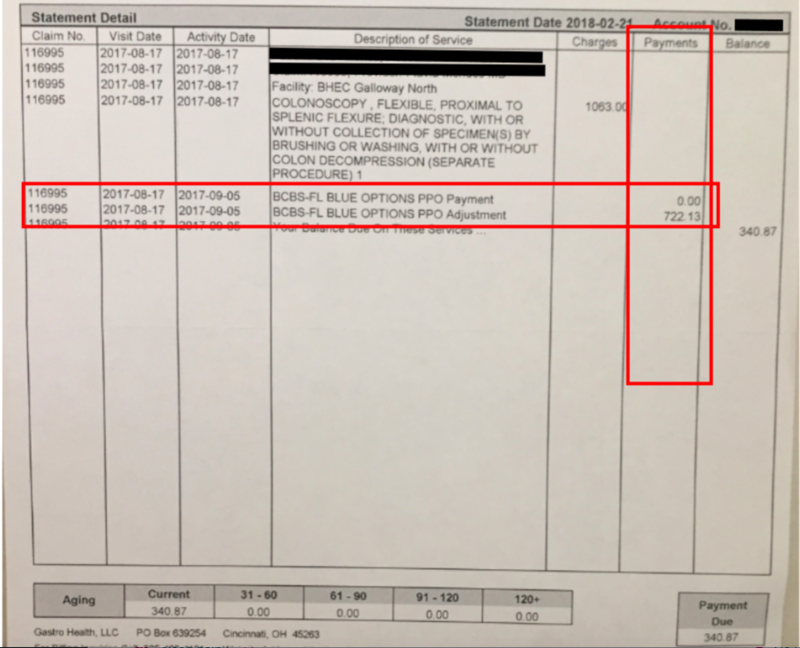 The fact that it’s clear lets us see that — once the explanation is matched up with the bill — that the patient was asked to pay $278 for a chest X-ray, the only radiology charge here; the insurer allowed $205.72 for that, after plan discount. That chest X-ray can cost $35 or so many places. In hospitals, it’s more expensive. Read the notes, and compare carefully. This woman had a colonoscopy, and the hospital initially sought to charge her for an anesthesiologist. She refused well before the procedure, so was sure no anesthesiologist had been used. The insurer refused to pay for the non-existent anesthesiologist, saying in its footnotes when that claim was denied that it was part of the “contracted and/or case rate paid to the provider. She was also charged a facility fee, medical services fee and recovery room fee at the same time. 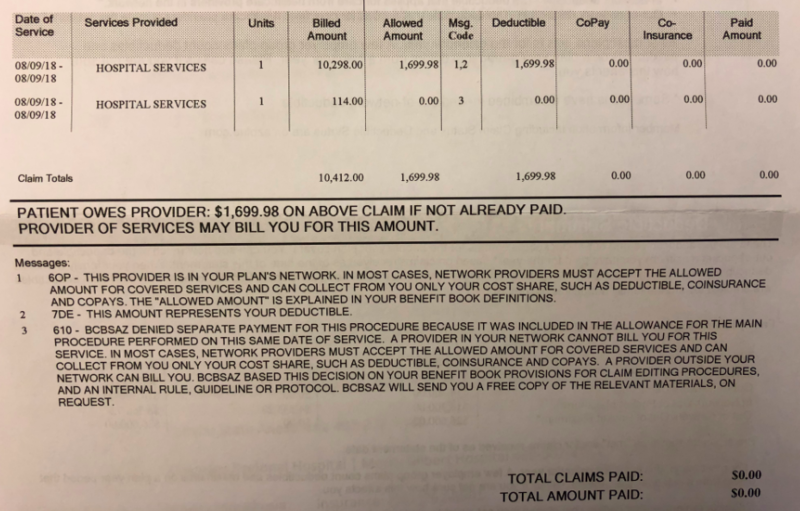 The insurer figured her total responsibility for all of this at $1,999, noting that “medical service” and recovery room were part of the facility fee charge. (See first screenshot here.) 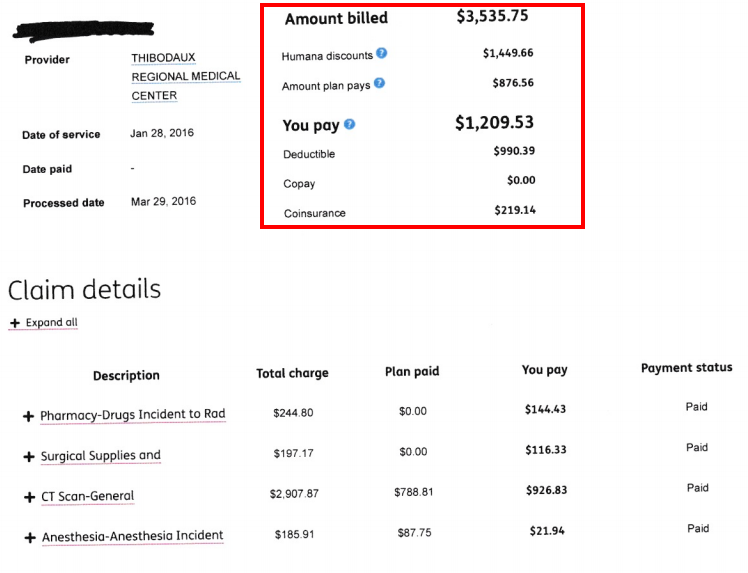 She asked to be billed properly — so the insurer re-billed, omitting the anesthesiologist but still figuring her total responsibility as $1,999. (See second screenshot here.) So she got a new bill, but it didn’t change what she was asked to pay. We’ve said it before and we’ll say it again: A discount off a fancifully high charged rate is not a savings. But a bill that looks like this makes it seem that it is a savings. The really big number saying “Amount you saved” is the first thing you see, and the first thing you might take away: “Gosh, I’m glad my insurance company took care of that.” Essentially, that’s the insurance company’s writedown of the initial charge from the hospital to the insurer’s contract rate. Also, the man who input this bill into our database was certain that his insurance company had paid upwards of $10,000 for the echocardiogram in the second screenshot, too. 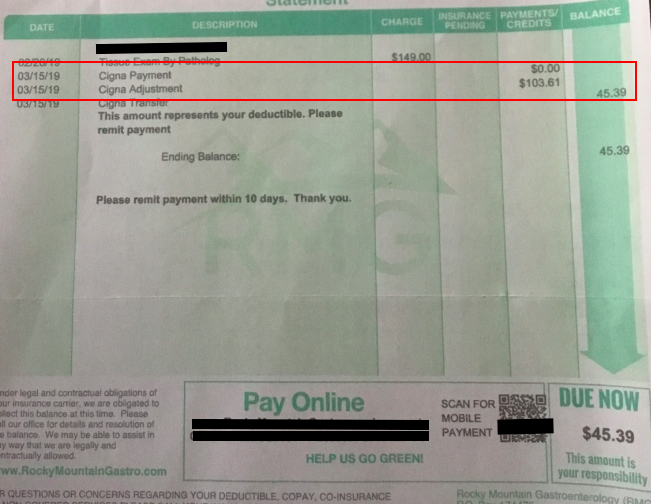 As it happens, the insurer paid nothing; he paid the entire $1,176.61. For a discussion of “anchoring” a person’s mind on a high price, see this blog post referring to seminal behavioral economics work by Daniel Kahneman and Amos Tversky. This person was absolutely sure that the insurance company had paid $857.49 + $352.23 = $1,209.72, though the bigger sum was clearly labeled “payment” and the “contractual adjustment” was labeled as such. Is it a payment or an adjustment? Wait, it’s both! This bill clearly identifies the sum of $722.13 as both a payment and an adjustment. The vertical “payments” column is quite clear. Just as clearly, there was no payment at all, judging from the horizontal selection. Check out the notes: We’re not paying this! 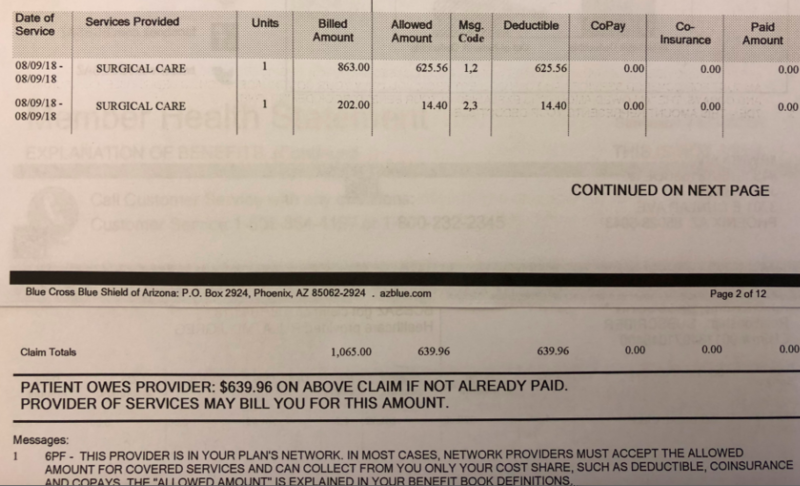 Hospital bill for a hernia operation in Arizona. Second bill for the above hernia operation, this one for the anesthesia. Third bill for the hernia operation, this one for the surgeon. Three stars for clarity. Charge is for “58110 Bx done w/colposcopy add-on.” But the code for the procedure is nowhere visible on the bill. Other points: Plan discount, amount allowed, plan paid, fairly clear. Also what’s deductible, copay, co-insurance. We’re confused by the coinsurance, though: Of the second surgery charge, $18.86 is deductible and, coinsurance is $11.33? 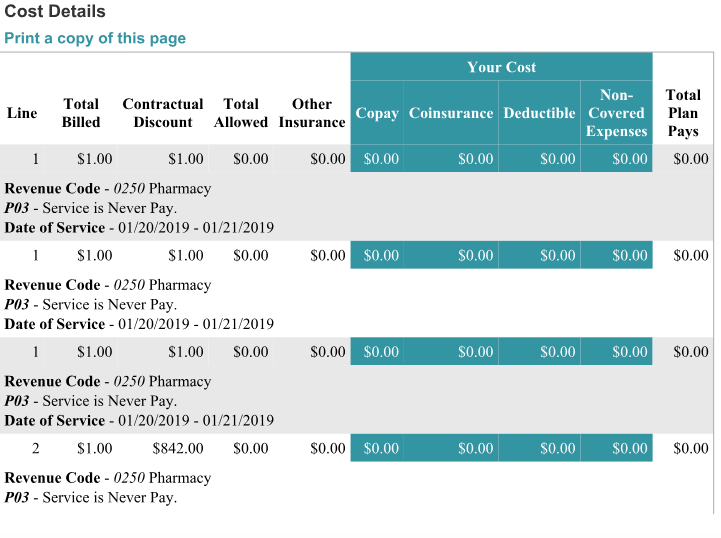 We’d have to see the plan document, deductible status (how much was spent) and then the coinsurance language — do they pay X percent of the remainder after the deductible is spent? Anyway, this is a pretty clear EOB — aside from the fact that they don’t say what this is all about in anything like standard medical coding language. San Francisco Gynecology, San Francisco. Very clear: Charged price, discount and payment are easy to understand. 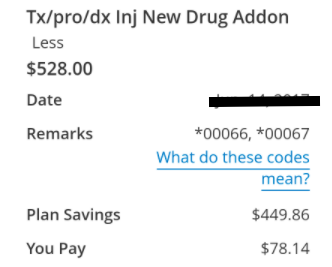 Why the system works this way is less clear, but at least some things are obvious — if you know what “Blue Cross discount” and “allowed amount” actually mean. Multiple duplicate charges. This seems designed to confuse: All the duplicate charges in the red boxes make it clear that the total is the total only of some of the charges, the ones with *** notations. What possible value comes from listing them twice? Payment clear, LOA seems to be the write-down. This was for treatment of an ectopic pregnancy. Fairly clear. Confusing: No information on what kind of tests these were. We’re just not going to pay. That is all. This is an EOB for removing impacted ear wax. 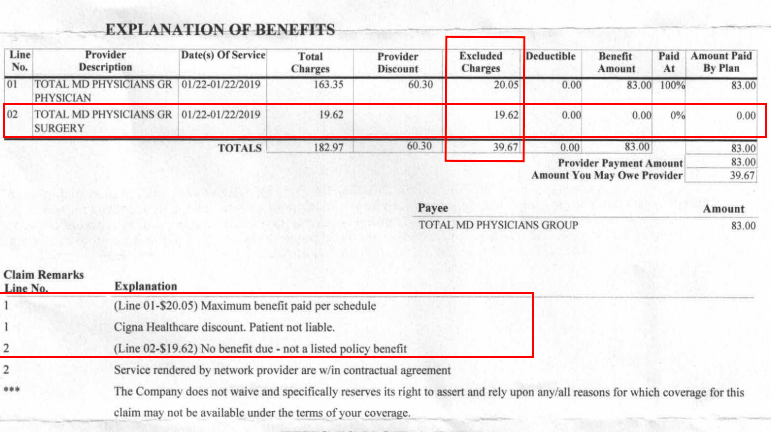 Note that there is a “provider discount” and then “excluded charges,” with the notes explaining first that the insurer threw out $20.05 because this is “maximum benefit paid per schedule” and then threw out $19.62 because it is “not a listed policy benefit.” Also catch the wording under the triple asterisks: “The company does not waive and specifically reserves its right to assert and rely upon any/all reasons for which coverage for this claim may not be available under the terms of your coverage.” What language is this? What does it mean? Remicade infusion at a Kaiser facility. How much was paid? Not at all clear; “Paid by insurance/ Adjustments/ Discount” are all together on one line. Note here that Kaiser is both provider and insurer, so they are essentially billing themselves, and granting an adjustment/discount to themselves, and paying themselves. Again, the insurer paid nothing. This is such a common occurrence, it seems almost routine: conflating the payment and adjustment to make it seem that the insurer paid. Of course, the insurer paid nothing. In this case, at least you can see it; in other cases, there is no clarifying breakdown at all. The person who received the bill felt certain that the insurer had paid. Sometimes it looks as if chimpanzees are typing in a random string of numbers. Note here that the “contractual discount” either equals the total billed, or is greater than the charge of $2. And in the final entry, the total billed, minus contractual discount, should be the total allowed. Nope. This was an emergency hospitalization, so the “bill does not match authorization” note makes little sense. What are all these $1 charges for? They clearly perform some function from the provider (a hospital) and the insurer, but it’s a complete mystery otherwise. “Service is Never Pay” doesn’t actually tell us much. The final one, a charge of $1 with a contractual discount of $842, is a real head-scratcher. At least adjustments and payments are separated out. What’s less clear: The bill of $1,079.00 results in total payments of $109.65, almost a 10x markup. Note how confusing it is that the charges all wind up in the “you pay” column — and then the adjustments and insurance payment are removed, insuring confusion. Notice too that it’s impossible to determine what the insurer paid for any test. And why are the Vitamin B and Vitamin D tests so expensive? In fact, at a second glance, all of these charged prices are high. These are routine tests from an annual physical. 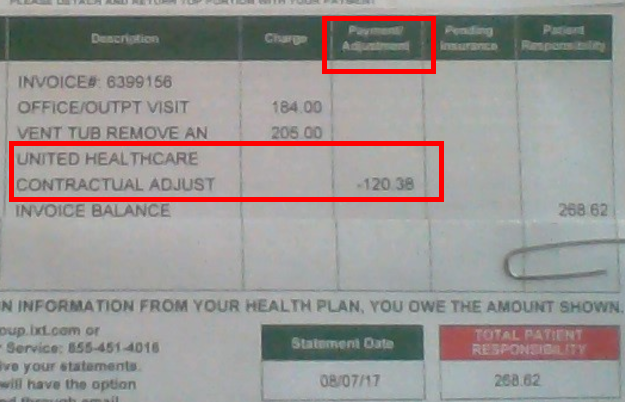 Again, the “adjustment” is interpreted by the patient as the insurer’s payment. People just don’t see — or don’t correctly decipher — the fact that the Payment column is empty while the Adjustment column has a number in it. This was a brain MRI with and without contrast — and please note that the charge for the contrast material went directly to the patient. The patient also could not identify the procedure — there’s no CPT code, and he identified it as “other,” not the brain MRI without contrast described here. There’s information in the footnotes. 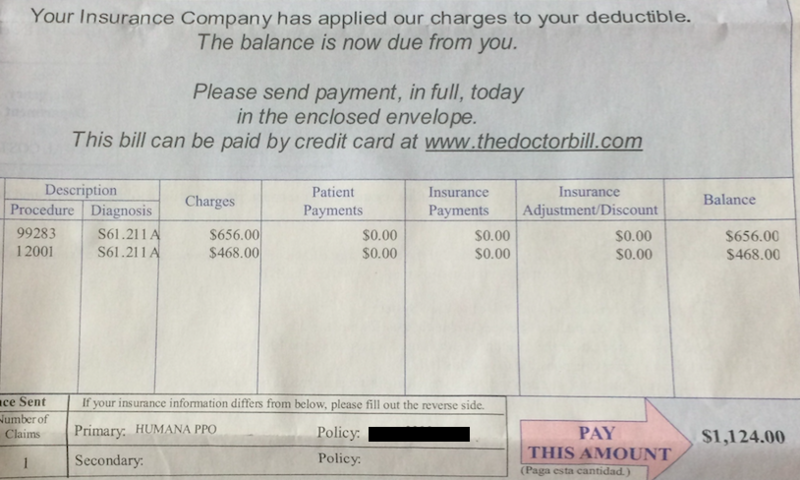 The $292.95 is not what the insurer paid, but rather the insurer’s discount. See footnote 066. The patient construed this as a payment from the insurer, once again thanks to misleading EOB design.